This pattern is part of the Fall 2017 Malia CAL (Crochet-Along). 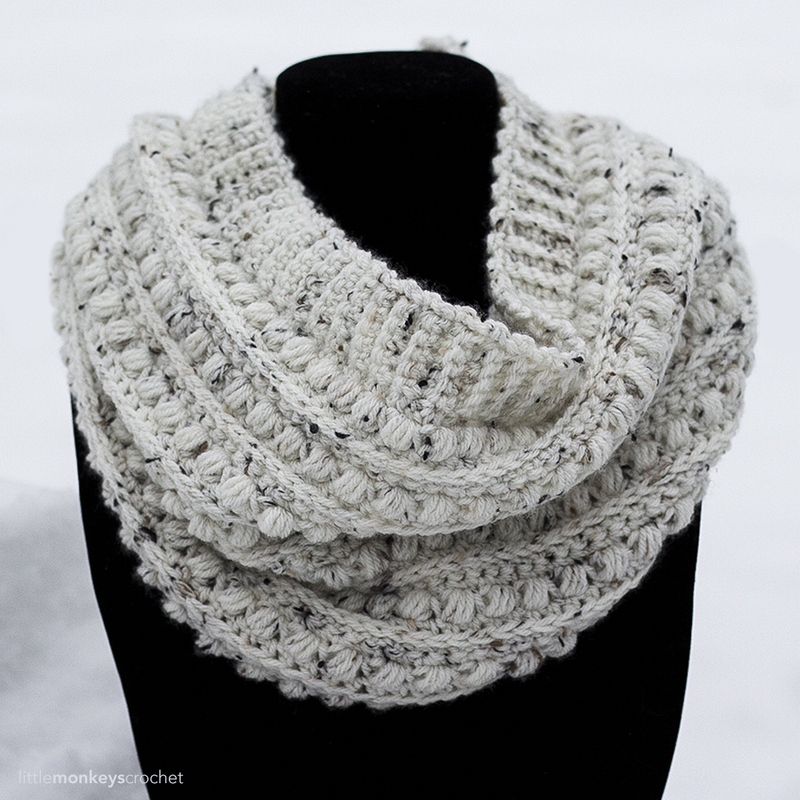 To view the other patterns in this collection (including a slouchy hat, beanie, infinity scarf, buttoned cowl and more), please visit the Malia CAL Homepage. I got so many requests for a messy bun hat pattern last season. The problem was, I had already gone on a self-imposed maternity leave by the time the messy hat trend exploded! I’ve had quite a few people ask me if I believe the messy bun hat will be popular again this season, and while I don’t think it will match the absolute CRAZY levels of viral-ness it did last year, I do think that the messy bun hat is here to stay. Why? Because it’s more than just a style trend. It’s also super practical! The concept has been around for a long time, but now that a lot more people know about it, I think it will probably become a regular part of the winter accessory lineup. 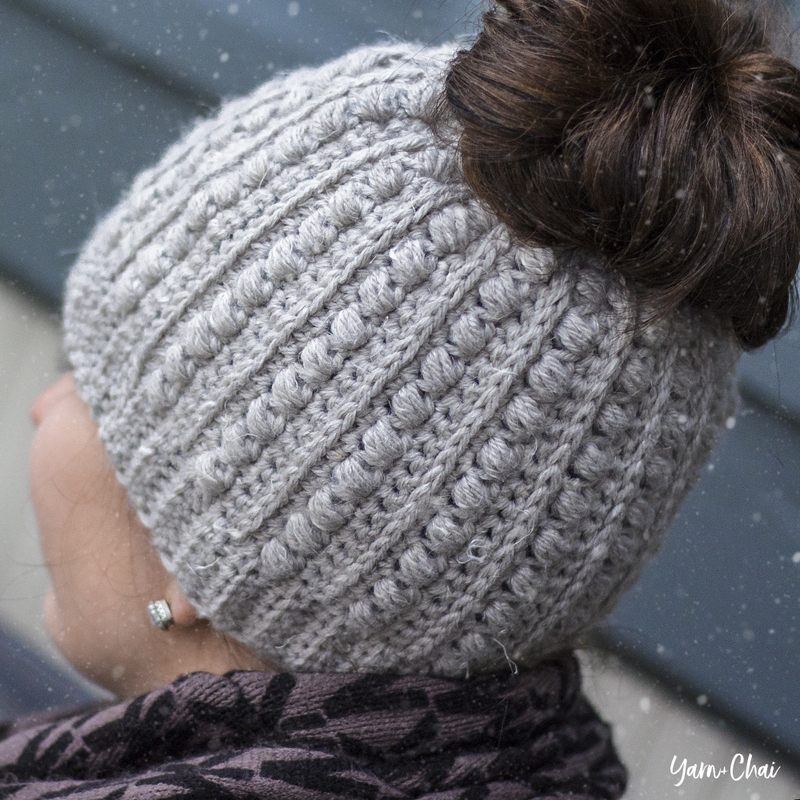 So, my first messy bun hat pattern is here! (Sorry it’s a year late.) 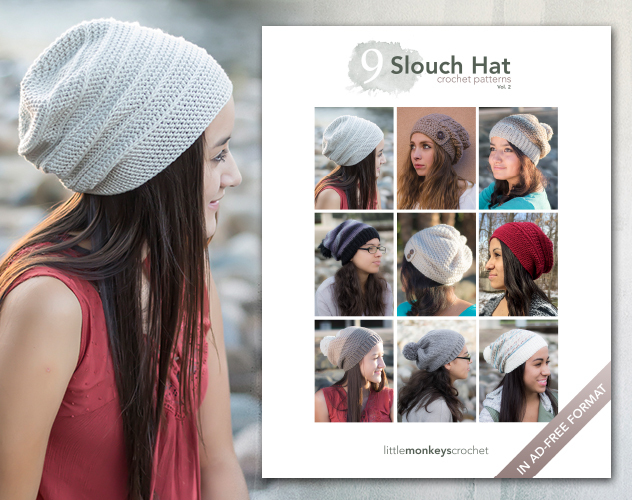 If you’ve already made a Malia Beanie or Malia Slouch, this will be super simple for you. If you haven’t, I recommend you watch the video tutorial for those hats to get you started. 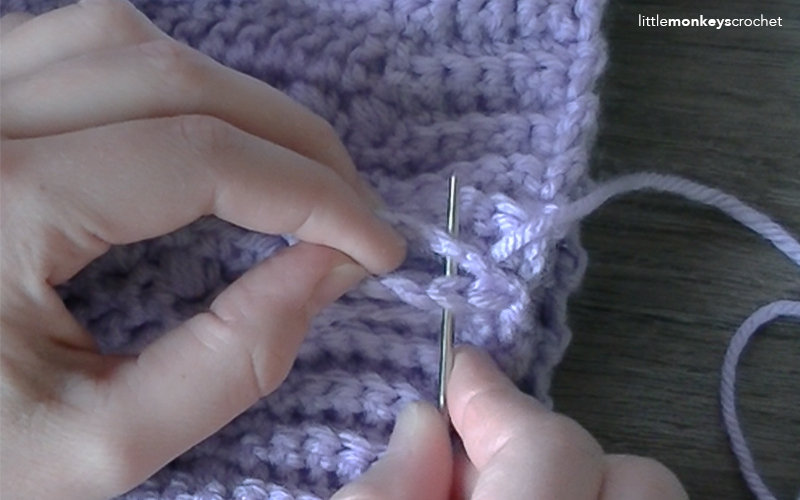 The tutorial shows you step by step how to make the beanie (adult large size) but all we’re doing to convert it to a messy bun beanie is skipping straight to Round 3 and working it around a hair elastic. Everything else is the same! Here are a few more photos. 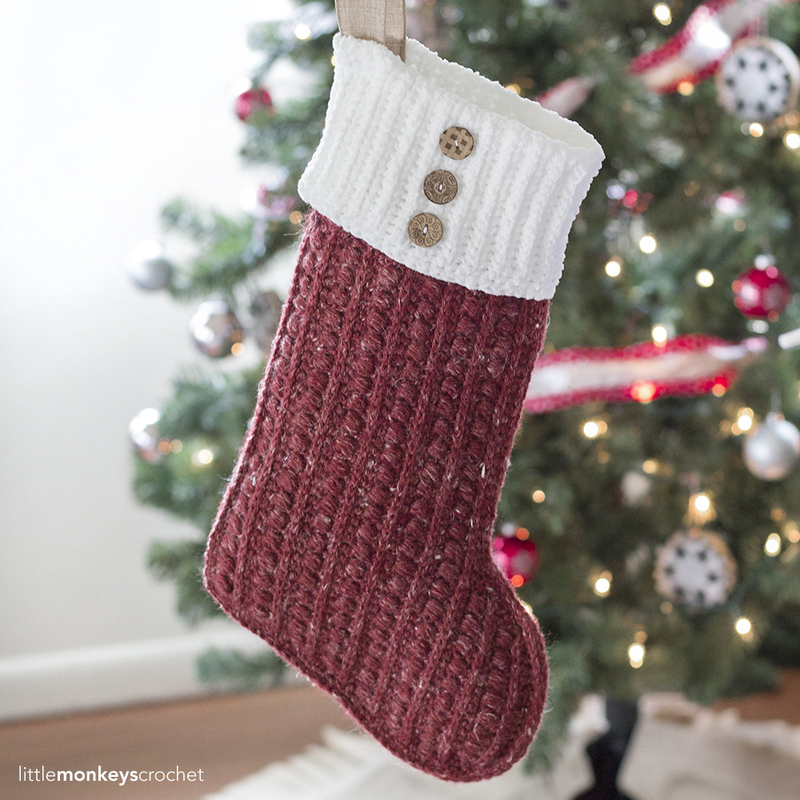 Scroll down for the free pattern! I made some cute printable tags for this pattern that you are welcome to use! If you’re selling or gifting this hat, a tag or wrap just ups the professionalism, in my opinion. I included a wraparound label (shown in the photo) as well as a smaller tag that can be attached to a piece of decorative string wrapped around your finished product, by punching a hole through the corner and threading the string through before tying a bow to secure. Print on cardstock for best results! Finished Size: 8.25" tall x 18.5" around (teen / adult small), and 8.25" tall x 20" around (adult medium / adult large). 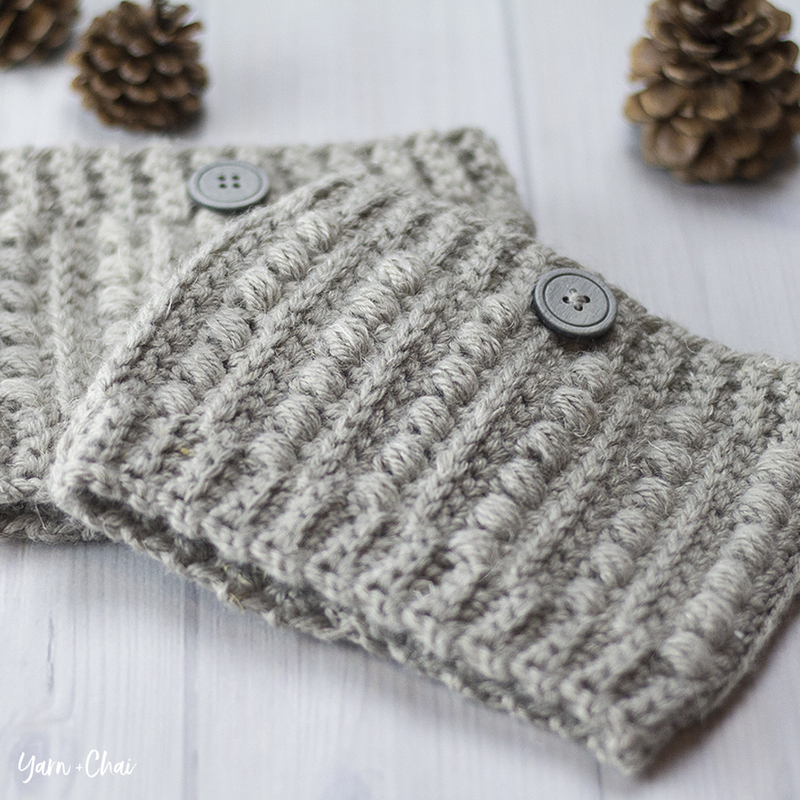 (3) Click here to view a video tutorial for the beanie version of this pattern. (4) Individual instructions are listed first, followed by seaming instructions at the bottom, which is the same for both sizes. Your elastic will be VERY crowded with stitches and will be wavy. This is good! We are now switching to vertical rows, and working them one by one using the stitches we just crocheted around the elastic. 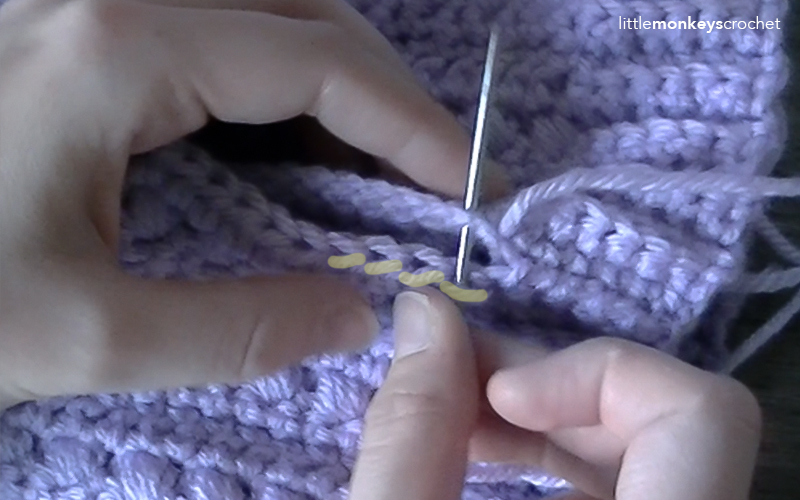 The pattern refers to the stitches around the elastic as the "base round". Rows 10-65: Repeat Rows 2-9, in order, 7 more times. Rows 66-72: Repeat Rows 2-8. Rows 10-81: Repeat Rows 2-9, in order, 9 more times. Rows 82-84: Repeat Rows 2-4. Done! If you're sharing on social media, be sure to hashtag #maliacal and #maliamessybunhat, and tag me @littlemonkeyscrochet. Hope you enjoyed it! Hi, and congratulations to your families addition last year! you have some cute sons and it’s fun to see your posts with them. Has anyone made the brim wider to flip up on the beanie? I was thinking of trying that but didn’t know if it would need extra stitches to make it look and fit right? I love this CAL! I have long hair, and battle static electricity and fly aways. After finishing the first two patterns, I picked up Deborah Norville, Cotton Silk yarn from premier to use on the ear warmer pattern. Wow! what a magic combination. I have made a couple of the ear warmers in the cotton silk and have worn them almost constantly since. Thanks for doing this CAL , my warm ears and head thank you also ! I love this Messy Bun pattern. It looks great and classy. I’ll love wearing it & so will my granddaughter. Hi! Love all of your patterns! I am having an issue I’m hoping you can help me with, I made a malia hat and it was huge! Teen adult small size using a size h hook. I am trying another and my gauge with an f hook is still 5 inches! 🙁 heeelp! Lol, I am not a really loose crocheter either. Thanks!!! My compliments to you on your easy to understand patterns and the beautiful products. I adjusted your adult beanie pattern to fit my first great granddaughter. 3 months old. And then I ran onto your pattern for a baby. Thank you so much for your free patterns. Going to do the messy bun beanie for my fifteen year old granddaughter. Thank you so much. What a cute beanie. This is the perfect solution to long hair and wearing a hat. So many times my hair makes my hats sit funny, but this hat lets me deal with that problem and it’s cute, too. Love this pattern, It was beyond any I had tried before and it came out well, with a few pull outs along the way, The gage pattern was helpful and I noticed that the practice piece made a good start on a child’s hat. I just added the ribbing to one end and it was great, Thanks. I enjoy all that you are teaching making these patterns easier to make and enjoy making these precious patterns for our loved ones thank you God Bless you abundantly. Thank you for this Lovely pattern. This wil be one of my christmas gifts. First of all thankyou for the pattern. What would you suggest the base start for a small child be? Thank you so much for this pattern. I’m working on it right now and it’s super fun! I love how the brim is worked right into the pattern! Also, I never really do a guage, but I’m thankful I did this time otherwise it would have been huge! I will be sure to tag you in the finished product. Thanks again! Congratulations on your baby! I pray everyone is healthy. I love this beanie bum pattern. I did the gauge check (which I NEVER do) and adjusted my hook size. I have done 20 rows and just checked the length and it looks to be about an inch too short. Should I add more stitches to my rows or will this correct itself?